Coiled cable (full length ca. 40 cm) connects from an XLR-3 plug to a four-pole right-angled mini jack plug with wiring specific to an iPad and iPhone. The KA 600i XLR to Mini Connection Cable from Sennheiser enables self-powered audio sources like the MKE 600 camera-mount shotgun to connect to any Apple mobile device, offering fantastic flexibility to videographers and video journalists shooting on the run. This combines professional-quality audio capture with a device that would otherwise deliver a very poor audio result. 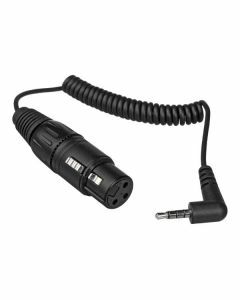 The coiled cable stretches to a full 15.75" and patches a three-pin female XLR connector to a right-angled 1/8" (3.5mm) TRRS mini jack with iOS compatibility.